With funding from the DentaQuest Foundation, the Florida Institute for Health Innovation (FIHI) has coordinated multiple statewide oral health initiatives in its effort to reduce disparities and improve the oral health of people living in Florida. Florida Pediatric Emergency Department Visits for Preventable Oral Health Conditions: 2012: On September 17, 2014, FIHI released a one-page supplement to the February 2014 oral health emergency room data. Emergency Department Use for Oral Health Conditions: 2011 and 2012: In February 2014, FIHI released the report entitled Hospital Emergency Department Use for Preventable Dental Conditions: 2011 & 2012. Scroll to the bottom of the page to view data for the state and all 67 counties. Results-Based Strategic Planning toward a Statewide Road Map: From January 2013 – April 2014, FIHI facilitated a structured, results-based strategic planning process with the statewide oral health coalition’s Leadership Council. The draft product – a strategic roadmap for oral health – consolidated the strategies now included in three separate statewide plans to improve oral health. Survey of Primary Care Physicians regarding Oral Health Training and Practice: In 2014, FIHI created and conducted a survey of Family Practitioners, Internists and Geriatricians throughout Florida in order to: 1) assess Florida’s primary care physicians’ level of oral health knowledge and application of this knowledge in practice settings and 2) determine Florida primary care physicians’ need for and interest in receiving oral health training. This produced lessons learned regarding methodology. In 2013, FIHI surveyed Florida’s primary care medical residency programs to assess the the level of dental education and training offered. Consumer Engagement: FIHI is gathering information from parents of Medicaid-eligible children regarding barriers to accessing dental care through 1) completion of a 20-question hard copy or online survey 2) real-time survey completion with FIHI staff and volunteers and 3) parent focus groups. FIHI will present this information to decision-making institutions, entities, individuals and groups such as the Centers for Medicare and Medicaid, the Florida Agency for Healthcare Administration, the Florida Association of Community Health Centers; dental professional associations and policy-makers. DentaQuest Regional Oral Health Connection Team: In 2014, FIHI was one of five southeast regional leaders working with the DentaQuest Foundation to facilitate a 12-state regional oral health change agent network. 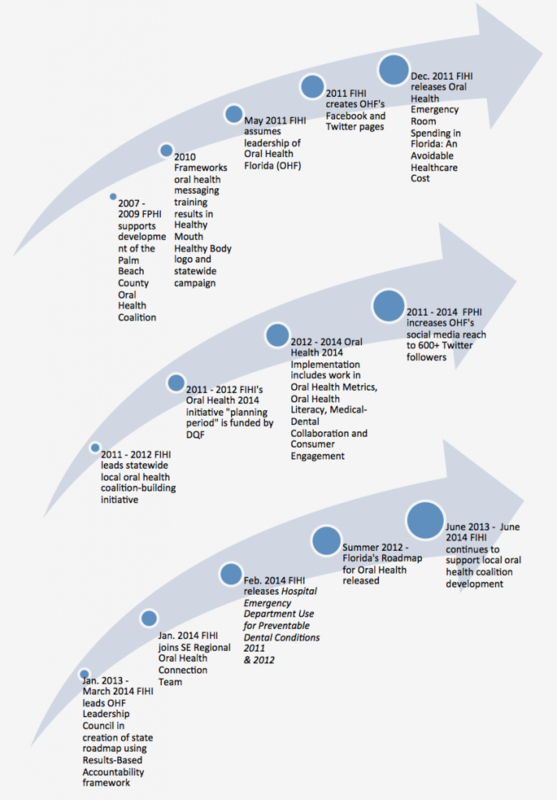 In this role, FIHI helped to create connections, foster collaboration, and develop plans of action in order to align and maximize efforts toward a common set of Oral Health 2020 goals. In 2015, FIHI is serving as the Florida state lead in this effort. Support of Local Oral Health Coalitions: From 2009 – 2014, FIHI supported the development and growth of local oral health coalitions who now continue to address the needs of their specific communities.